More details have been emerging about China's ambitious space programme, just days before the country is expected to launch its first manned space flight. A top defence official, Wang Shuquan, confirmed what has been reported before in Chinese media - that the country is planning lunar landings after it succeeds in putting a man in space. And the state-run Beijing Youth Daily newspaper has reported that China plans to send a research satellite to orbit the Moon within the next three years. A lunar orbiter would be launched by rocket and reach the Moon in eight or nine days, the paper said. It would circle the Moon for a year, gathering information about the lunar geology, soil, environment and natural resources, it added. The BBC's correspondent in Beijing, Louisa Lim, says these comments are a sign that Chinese ambitions in space go far beyond a manned space flight. But our correspondent says that what happens to those plans is likely to depend on the success of China's manned space flight. Although no dates have been officially revealed, the mission is believed to be just days away. The speculation in the Chinese press is that it will blast off just after a plenary meeting of the Communist Party's central committee, which ends on 14 October. A leading space expert, Chen Lan, said that "the launch cannot come before 14 October because Chinese leaders will be attending an important meeting in Beijing and I believe some of them, like (former president and military chief) Jiang Zemin, will want to be at the launch site to witness the launch". Mr Chen, curator of the Go Taikonauts! website, said the Shenzhou V would orbit the Earth at least 10 times in a flight lasting less than 24 hours. A successful launch is likely to spark an outpouring of national pride, boosting the credibility of the Communist Party. 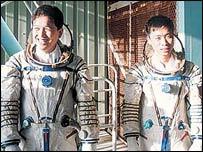 It is not yet known who China's first man in space will be. But reports say 14 would-be astronauts have arrived at the launch pad at Jiuquan in western Gansu province and are training inside the actual spacecraft. "Outside the Chinese government, no one knows when this launch is going to take place"